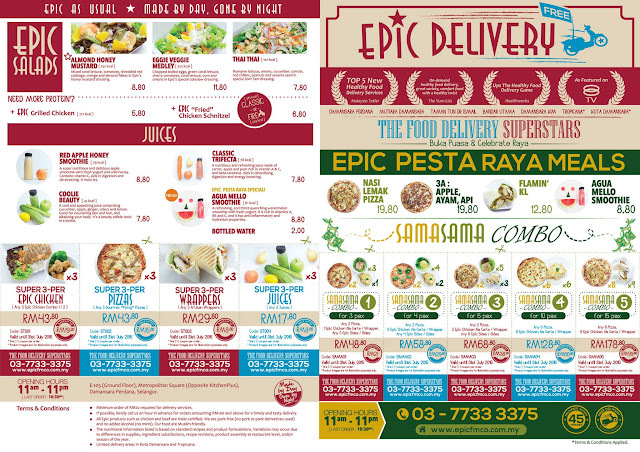 Made by Day, Gone by Night … Eat Healthy with Epic Delivery! It’s hard to eat Healthy! At least for me, balancing family time with my full-time work and blogging leaves me little time to cook as often as I like. I try to eat healthier at times but when you are just short of time, dining out is the easiest and fastest option at times. Then a friend introduced me to Epic Fit Meals Co. recently. 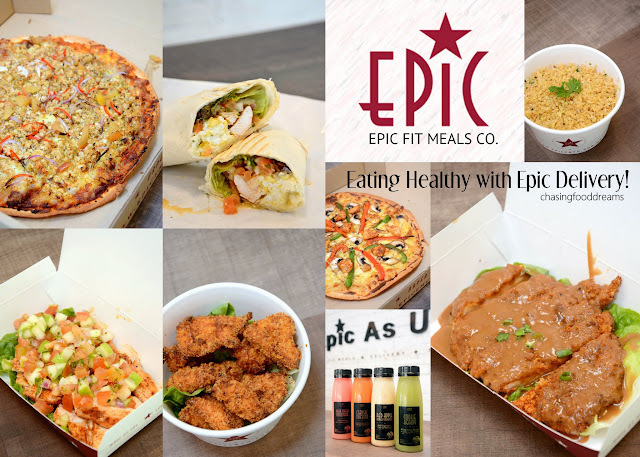 Epic Fit Meals Co. proud themselves by their concept of healthy and affordable food with epic delivery services. Located at Damansara Perdana, one can dine at their limited dining space at their shop or simply order a take-out. Epic Fit Meals Co. is owned by three partners who shared the passion for serving healthy food fast to their customers. Opened for 6 months, they have two main focus of serving healthy food and the best delivery services possible. While many tend to focus on the food, Epic Fit Meals Co. has set their goals in their food concept, the packaging, the food quality and the delivery. One of the partners had lived in Melbourne for 6 years and has always enjoyed healthy simple and comfort food. When such concept in mind, Epic Fit Meals Co. pays tribute to their concept by using fresh ingredients bought daily and cook everything from scratch so that their diners enjoy real homemade healthy dishes. There are many food services also provided healthy food concepts but at Epic Fit Meals Co., one does not need to pre-order their food. One just needs to put in an order and they should get their order within 45 minutes with delivery services in their listed areas of delivery. If the delivery coverage is out of area, then a long wait may be required. Another plus point for Epic Fit Meals Co. is that delivery services is free and prices are net as GST is already included into the prices so one knows how much they are going to be paying for the meal upfront with no extra hidden costs. They may not have halal certification but we were ensured that their ingredients used are from halal certified suppliers and all their staff are local workers. 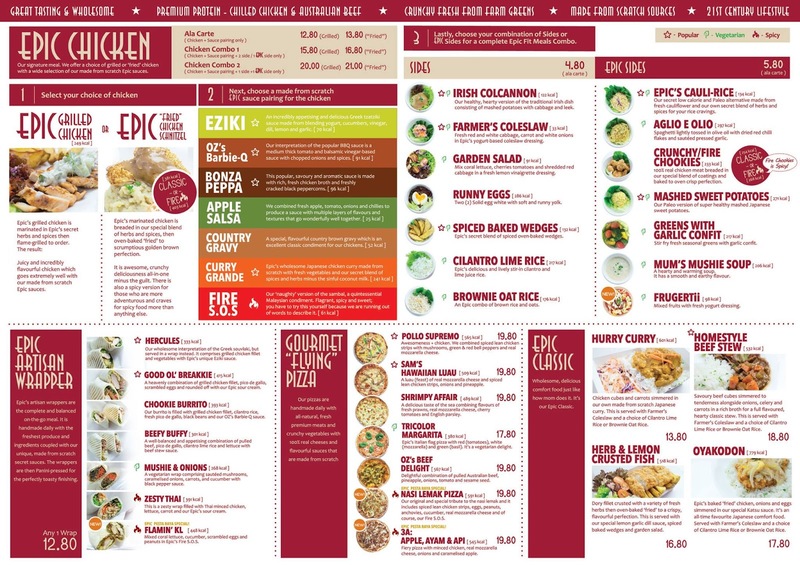 The menu at Epic Fit Meals Co. is surprisingly quite long with good variations of Epic Chicken with various Sauces, Epic Artisan Wrapper, Gourmet Flying Pizza, Epic Classic, Side dishes, Epic Salads and Juices. Every dish is carefully measured and the portion with calories are listed in the menu as well. Watch out for promotional sets during festive seasons. From the Epic Chicken, there are two choices of chicken served. Simply choose from Grilled Chicken or ‘Fried’ Chicken Schnitzel and then select one of the seven choices of sauces available. We started with Epic Grilled Chicken with Apple Salsa (RM12.80) - 25 kcals per serving. The grilled chicken was moist and tender and I really enjoyed the tangy fruity apple salsa on the chook. Vibrant and fruity flavours from the apple salsa is very enjoyable. The dish also doesn’t leave a heavy note after savoring it. ‘Fried’ Chicken Schnitzel with Country Gravy (RM13.80) - 52 kcal per serving is technically not deep fried. Instead, one gets lean chicken meat breaded in breadcrumbs, herbs and spices and then is oven baked ‘fried’ till crispy. The country gravy is a homemade brown gravy that decent in taste. If you prefer the sauce to be serve separately, do make sure to specify this and let the ordering team know else all sauces are poured over the chicken unless specified. From the Epic Artisan Wrapper section, we tried their Good Ol’ Breakie (RM12.80) - 415 kcal per serving and Zesty Thai (RM12.80) - 391 kcal per serving. Good Ol’ Breakie has a filling of grilled chicken fillet with pico de gallo, scrambled egg and sour cream wrapped in flour tortilla wrappers before being finished on the Panini pressed to toast them up. Zesty Thai has Thai flavoured minced chicken paired with lettuce, carrot and sour cream. While one echoed breakfast flavours, the second had more of a spice heated flavours. Both are nicely tangy from the sour cream used. I really like their pizzas. Served thin crust style, we went for their fusioned flavour of Gourmet ‘Flying’ Pizza of 3A: Apple, Ayam & Api (RM19.80) - 545 kcal per serving and a classic one of Gourmet ‘Flying’ Pizza of Pollo Supremo (RM19.80) - 565 kcal per serving. The 3A: Apple, Ayam & Api is spicy in heat with its combo of minced chicken, apple, chili, onion and mozzarella cheese. I like the kick of heat as it boosted the flavours of pizza to our Malaysian flavours. The Pollo Supremo was not too bad with its spiced lean chicken paired with mushrooms, bell peppers and mozzarella cheese but if you like spicy heat flavours, go for the 3A pizza. There are Sides and there are Epic Sides! From Epic Sides, we had their Crunchy Fire Chookies (RM5.80) - 233 kcal per serving, Epic’s Cauli-Rice (RM5.80) - 134 kcal per serving and Mashed Sweet Potatoes (RM5.80) - 271 kcal per serving. The Epic Cauli-Rice is perfect for Paleo diet diners as one can enjoy the delicate flavours of the minced cauliflower seasoned with a secret blend of herbs and spices while the Mashed Sweet Potatoes has steamed Japanese sweet potato mashed and served with its skin too for extra vitamins. Irish Colcannon (RM4.80) – 122 kcal per serving, caught my attention from the Side menu. It’s basically mashed potato with cabbage and leeks, a classic dish taken from Irish cuisine. There is a brown gravy served with it. I cannot taste the cabbage and leeks as the brown gravy seemed to have masked the vegetables. Choices of beverage are very minimal and Epic Fit Meals Co. only has four types of Juices. We tried all four juices of Agua Mello Smoothie (RM8.80) - 61 kcal, Classic Trifecta (RM7.80) - 78 kcal, Red Apple Honey Smoothie (RM8.80) - 79 kcal and Coolie Beauty (RM7.80) - 41 kcal. My favorite of the lot was the Coolie Beauty with its combination of cucumber, apple, celery, ginger and lemon. They have also added Vitamin Water to the menu recently. It’s great to be able to order and enjoy healthy food for a change. With many now having busy work schedules, it’s great to have Epic Fit Meals Co. nearby so we can at least try to eat healthier without the hassle of cooking on some days!